"11. Cowboys and Indians (Sitting Bull)"
Known as the “Pope” of Pop Art, Andy Warhol is admired for his fun, bright, colorful images that blur the boundaries between high and low art, fine art and commercial illustration. Obsessed with celebrity and consumer culture, Warhol represented the rich and famous, including popular and political icons from Marilyn Monroe and Elvis Presley to Chairman Mao and Sitting Bull. Sitting Bull was a Teton Dakota Indian Chief known for his bravery in battle and his leadership role in attacks on U.S. forts in the West. 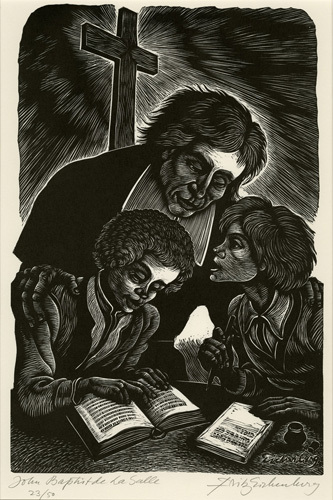 His resistance to the U.S. government led him to exile in Canada and eventual relocation to a reservation in the Dakota Territory. Later, in the 1880s, after befriending Annie Oakley, Sitting Bull joined Buffalo Bill Cody’s Wild West Show. Sitting Bull lent these spectacles of “Cowboys and Indians” an exotic element as well as an aura of authenticity. In 1890, U.S. officials ordered his arrest for his involvement with the Ghost Dance resistance ceremony. When Sitting Bull refused, a skirmish ensued, and he was killed by U.S. officers. 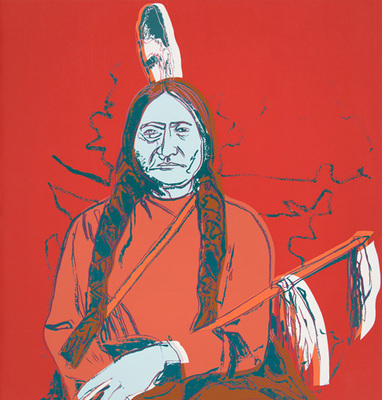 Sitting Bull is one of 10 screen prints from Warhol’s Cowboys and Indians series. Portraits of Annie Oakley, Teddy Roosevelt, General George Custer, and others are included in this collective mythology of the historic American West. As with other representations of cultural icons, Warhol does not portray a naturalistic representation, but rather a flattened, hard-edged, vibrant image that emphasizes the artifice and construction of identity, and the stereotypes that proliferate through mass media and popular culture. In a course titled Art and Identity in a Global World, students observe various artworks in the Art Museum that portray Native American people, history, and culture. Students are asked to contemplate how these artworks foster conversations about authenticity, cultural appropriation, Other/Othering, hybridity, stereotypes/typecasting, and dislocation. How does Warhol portray Sitting Bull? Do you think this is an “authentic” or “stereotypical” portrayal of Sitting Bull? Does Warhol challenge and expose the controversies surrounding our perception of Native American Indians, or contribute to the sentimentality of the romanticized “Wild West”?